Are you living in an unbanked state? NEW YORK (CNNMoney) - Nearly 10 million households across the country are living without a bank account. And in some states, these residents make up a big slice of the population. Among all of the regions in the country, the South has the largest percentage of residents who are "unbanked," meaning they don't have a checking or a savings account. According to an FDIC report released this week, 10% of the region's population doesn't have a bank account, compared to the national average of 8.2%. While 37% of U.S. households live inthe South, nearly half - or 46% - of all unbanked households in the country reside in this region. And so do nearly 40% of the nation's poor, according to the U.S. Census Bureau. And that's no coincidence, said Odysseas Papadimitriou, CEO of CardHub.com and former head of a team at Capital One tasked with identifying products for unbanked customers. "Wherever you see high poverty and low-income populations, you will see higher populations of unbanked," he said. 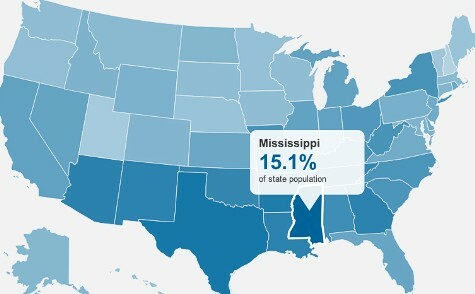 Mississippi, which has suffered the highest poverty rate in the country for years, also has the biggest population of unbanked households - with 15% of its residents lacking a bank account. Texas and Arkansas follow, with bankless rates of 12.8% and 12.3%, respectively. Compare that with New Hampshire, which has the lowest rate of unbanked, at 1.9%, as well as the lowest poverty rate in the nation.